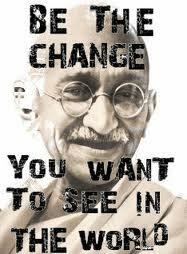 Ghandi says: “Be the change you wish to see in the world”. My mother has been known to say “ For the love of God, learn from someone else’s mistakes once in a while”. One has little to do with the other unless you really hurt your brain trying to come up with a connection; I just thought I’d throw them together, so don’t spend a lot of time on it. setting the stage for giving more, going above and beyond, cannot be more relevant, and important, if you want to be remembered. If you want to be top of mind when someone is wondering where to turn for a great coach. There are many of us out there, in the service industry, all trying to distinguish ourselves from one another. What makes the difference? Why will you be hired over the coach with the fancier website, the more frequent email campaigns, the catchier name? The difference is the level of service. It’s why my mother insists on going to the overpriced deli in town to get her chicken soup rather than going to Content marketing, extra value, little pink spoons, relationship marketing, “Givers Gain”. Call it what you may; all fairly new concepts and yet the oldest marketing concept (I refuse to call it a trick) in the book. Be the change- not only will it earn you more business but it will earn you more points in the big book of life. Suzen, I loved your Crazy Story Video. I love paying it forward. That’s a great message, especially at this special holiday time. thanks Robin. Time’s short; we need to move beyond the “transaction”!